The story of Hôtel La Citadelle Metz - MGallery by Sofitel starts with a war fought between France and the Holy Roman Empire throughout most of the 1550s. During the war, the French king, Henry II, invaded the realm of the Holy Roman Empire and captured the city of Metz. He left a small garrison behind, who erected a series of imposing fortifications all over the city. The garrison continued developing its defenses, even after it had successfully turned back a gigantic army led by the Holy Roman Emperor. Among the structures the soldiers created was a massive citadel that overlooked Metz. Within its sprawling complex was a large warehouse called Le Magasin aux Vivres, which stored food for the entire garrison. The citadel continued protecting Metz long after the war had ended, standing as an ominous warning to any nation interested in challenging France’s military prowess. But with the advent of new military technologies in the 19th century, the French authorities considered the fortress superfluous and decommissioned it. The French government demolished most of the citadel, sparring only the warehouse and a few other buildings. After sitting idle for more than two centuries, Le Magasin aux Vivres finally became a small boutique hotel in 2005. Sofitel now operates the building as the Hôtel La Citadelle Metz, part of its luxurious MGallery Collection. Hôtel La Citadelle Metz features 68 magnificent guestrooms and suites that reflect the building’s impressive heritage. Sofitel has endeavored to ensure that guests are fully engrossed in the hotel’s rich character while residing in any of its accommodations. Its renowned restaurant, Le Magasin aux Vivres, bears the original name of the building as a reference to the hotel’s past. Inside, Head Chef Christophe Dufossé and his team create classic French cuisine prepared with a modern twist. Guests can also sample Chef Dufossé’s delicious menu at La Brasserie, which has captivated diners since it opened. Dishes here feature exquisite seasonal fare made with local ingredients. Located at the entrance of Hôtel La Citadelle Metz, La Brasserie emits a cheerful ambiance that will amuse guests for hours. 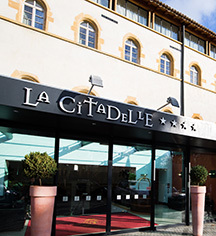 Hôtel La Citadelle Metz exudes an intellectual environment that is terrific for hosting professional meetings, as every conference room is outfitted with the finest business equipment without compromising the historical architecture of the space. With its cotemporary décor and academic atmosphere, guests are certain to be satisfied entertaining their colleagues at Hôtel La Citadelle Metz. The city of Metz is a timeless work of art. Countless visitors have strolled along banks of the Moselle River, fascinated by the city’s ancient landscape. Centuries of history stir within many of Metz’s historical buildings and neighborhoods. With each step, guests are certain to be awestruck by the teeming array of cultural attractions nestled throughout the city. Just beyond the Hôtel La Citadelle Metz is the Arsenal de Metz, a majestic concert hall in operation since 1859. The beautiful Governor’s Palace is also nearby, providing a rare glimpse into a time when Metz was once part of Germany. Even more historical attractions are only a few blocks away, such as the Temple Neuf, the Porte des Allemands, and the magnificent Cathedral of Saint-Étienne. Many museums and art galleries surround the hotel as well, with the neighboring Centre Pompidou-Metz and Musée de la Cour d'Or drawing thousands of visitors every year. Given its central location in the city, Hôtel La Citadelle Metz is the ideal starting point from which to explore Metz’s remarkable culture. 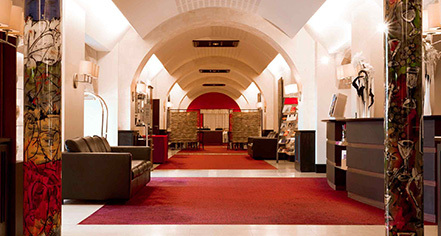 Hôtel La Citadelle Metz - MGallery by Sofitel, a member of Historic Hotels Worldwide since 2018, dates back to 1559. The French Ministry of Culture designated Hôtel La Citadelle Metz a Monuments Historque in 1969 while it was still known as the Metz Food Store. Airport Transportation: Available upon request; surcharge applies. Deposit: Credit Card or $100 per night deposit by cash is required at time of booking. Early Check-In/Late Check-Out: For an early check-in or late check out, 25% of the total amount of the night will be charged. Extra Person Fees: €30 per adult per night, breakfast included. Occupancy Restrictions: Varies by room type. The largest unit available on-property can accommodate up to four (4) people. Parking: Private parking is available at €15 per day; valet parking is also available. Pet Policy: Pets are allowed for a fee of €20 per night (Subject to change). Rollaways: Available upon request; surcharge applies. Smoking Policy: 20 smoking rooms are available. The story of Hôtel La Citadelle Metz - MGallery by Sofitel starts with a war fought between France and the Holy Roman Empire throughout most of the 1550s. During the war, the French king, Henry II, invaded the realm of the Holy Roman Empire and captured the city of Metz. Learn more about the History of Hotel La Citadelle Metz - MGallery by Sofitel .